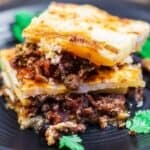 The epitome of Greek comfort food, moussaka is basically a hearty eggplant casserole with a juicy, flavor-packed meat sauce. 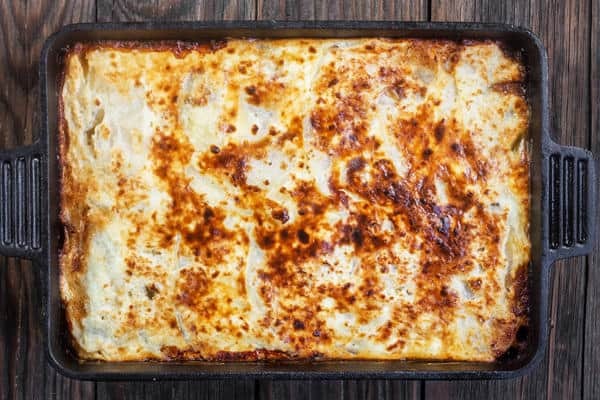 Topping the meat is either a rich bechamel sauce– a French influence that was introduced later–or, as in today’s Moussaka recipe, a cheese-based topping. 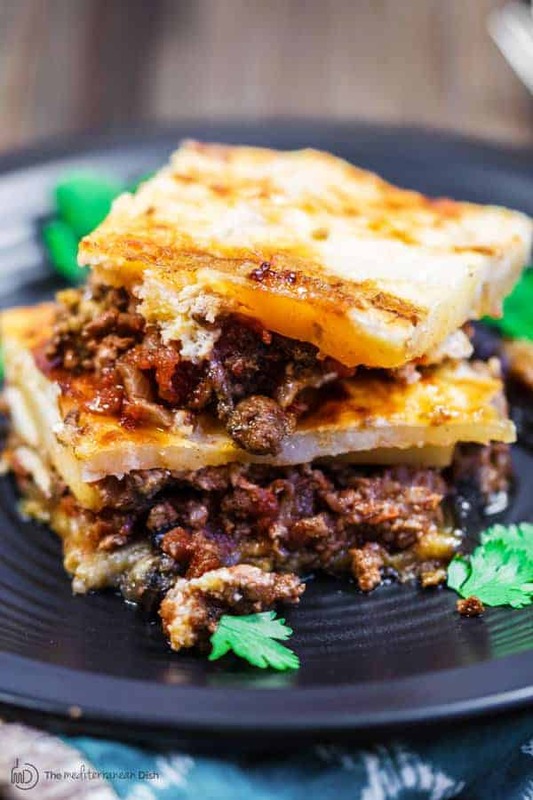 The variations in moussaka recipes go beyond the topping. 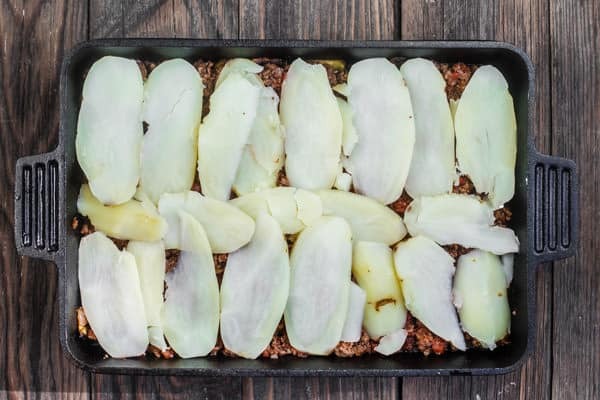 Some recipes even call for layers of other vegetables like zucchini squash; but more commonly, a layer of thinly sliced potatoes. Other Mediterranean countries have moussaka variations as well. Egyptian moussaka– adapted from our Greek neighbors– has fried eggplant with minced beef, all smothered in red sauce (no additional topping.) And there is a vegan moussaka, one with eggplant and green peppers as in this Turkish-inspired eggplant dish. But today, my mind went to the moussaka I had a few years ago in a small family-owned restaurant on the Greek Island of Patmos. So after reviewing several recipes, I came up with today’s mousska. My clever husband made this observation: moussaka to the Greeks is like shepherd’s pie to the Americans! 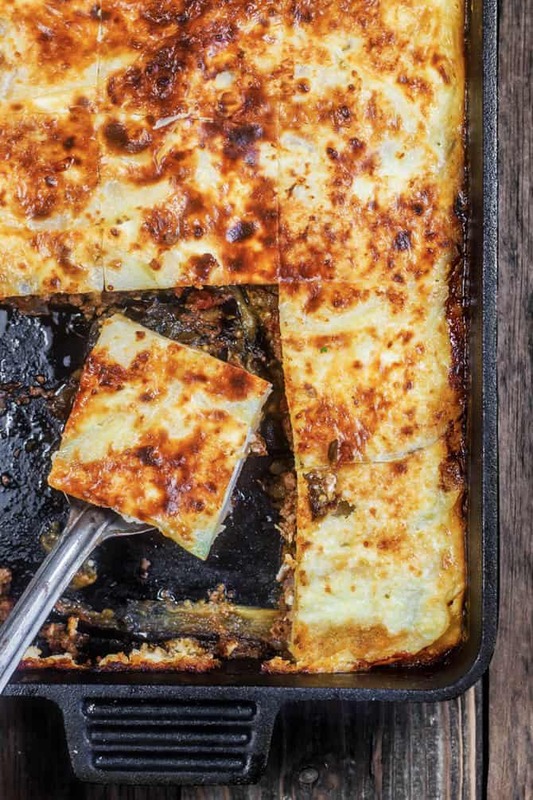 Just like shepherd’s pie, moussaka is a satisfying casserole that is a meal in itself. You can simply add a side salad and call it dinner. Spread the eggplant slices in one layer and sprinkle with salt. Let set for 30 minutes to “sweat out” its bitterness. 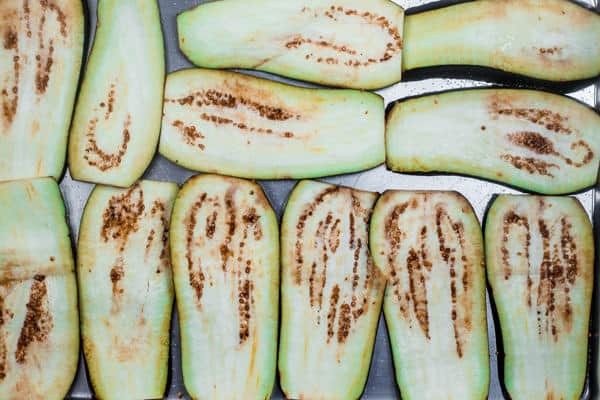 Pat the eggplant slices dry and assemble in one layer on a lightly oiled baking sheet. Drizzle generously with olive oil. 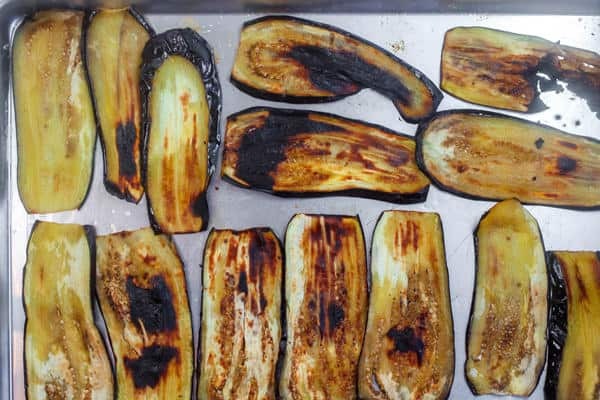 Place the baking sheet on the top oven rack and broil briefly, turning over so that both sides of the eggplant are softened and golden brown (do not worry if parts of the eggplant are slightly charred, but watch carefully so it doesn’t burn). Remove from the oven and set aside. Heat 2 tbsp olive oil in a skillet. Cook the onions on medium heat until they turn slightly golden brown, stirring regularly (about 5 minutes). Now add the ground lamb. Cook the lamb until fully browned, tossing regularly. Drain the lamb from any excess fat and return back to the skillet. Now add the dried oregano, ground cinnamon, pepper, nutmeg, and hot paprika. Stir to coat the meat with the spices. Add the wine and boil for 1 minute to reduce. Stir in the canned tomatoes, sugar and broth. Simmer on medium-low heat for 30 minutes. Preheat the oven to 350 degrees F. In the meantime, boil the sliced potatoes in plenty of water until they are completely soft and easily breakable (about 5-7 minutes). Drain the water and set the potatoes aside briefly. To prepare the cheese topping, whisk the Greek yogurt with the eggs and flour. Add the ricotta and feta cheese and whisk again to combine. 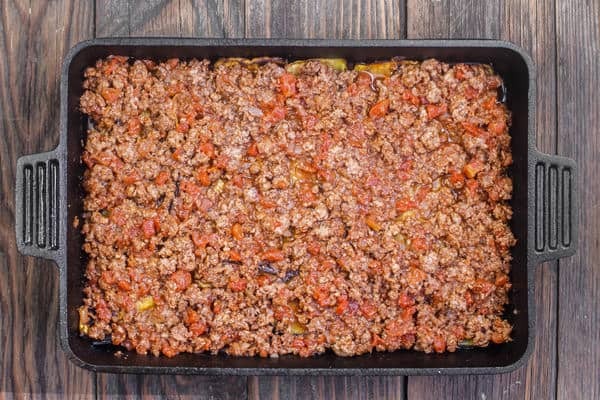 When ready, lightly oil a 9 1/2″ x 13″ oven-safe baking pan. Layer the eggplant slices on the bottom. Add the meat sauce and spread to cover the eggplant. 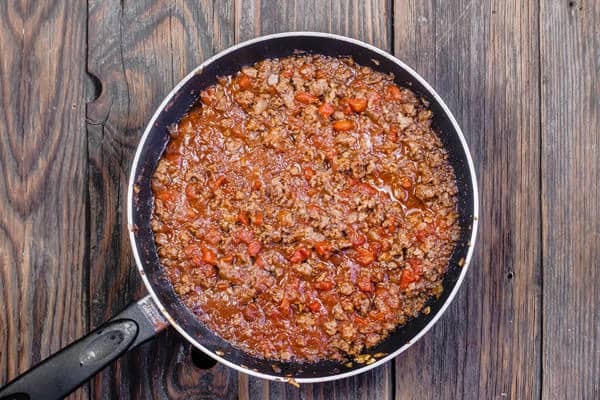 Layer the potato slices to cover the meat sauce and sprinkle with the bread crumbs. Finally spread the cheese topping to thinly cover the potatoes. Bake in the 350 F degree-heated oven for 45 minutes. If you need to, transfer the baking pan to the top rack and broil briefly so that the top of the moussaka gains a nice golden brown color (watch carefully). Remove from the heat and let sit 5-7 minutes before cutting through into squares to serve. Enjoy! 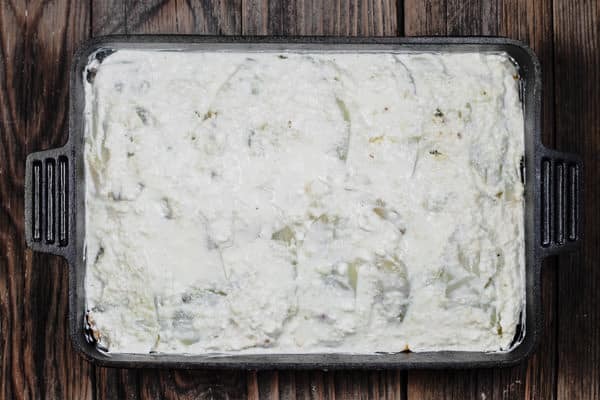 Greek Moussaka is a tasty, hearty eggplant casserole. Layers of eggplant, potatoes, and a spiced meat sauce nestled in between. 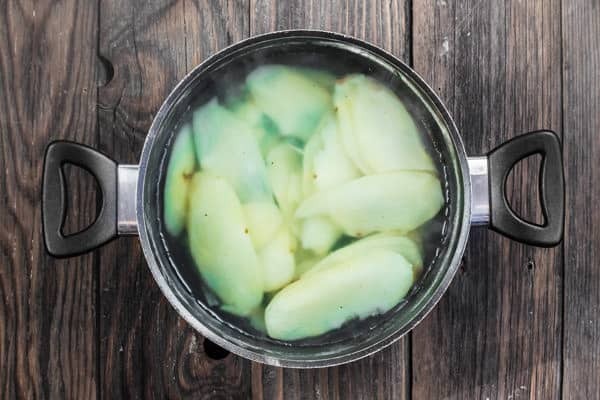 In the meantime, boil the sliced potatoes in plenty of water until they are completely soft and easily breakable (about 5-7 minutes). Drain the water and set the potatoes aside briefly. Bake in the 350 F degree-heated oven for 45 minutes. If you need to, transfer the baking pan to the top rack and broil briefly so that the top of the moussaka gains a nice golden brown color (watch carefully). Remove from the heat and let sit 5-7 minutes before cutting through into squares to serve. Enjoy! Prepare ahead note: you can prepare and cook the eggplant, meat sauce, and potatoes (steps 1-5) the day before or even a couple days in advance. Place each in its own tightly-shut container and store in the fridge. 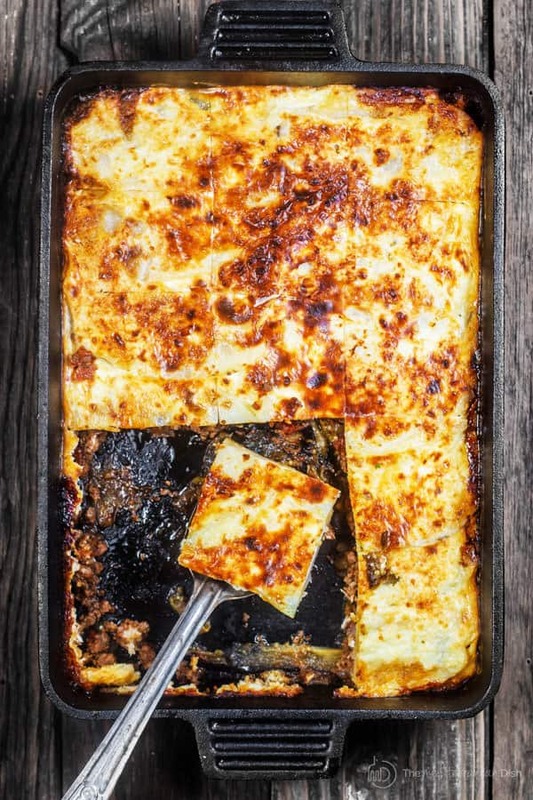 The day you are ready to serve the moussaka, bring the ingredients to room temperature. Prepare the cheese topping, then assemble the moussaka in an oven-safe dish and bake (steps 6-9). Recommended for this recipe: Private Reserve Greek extra virgin olive oil. SAVE! 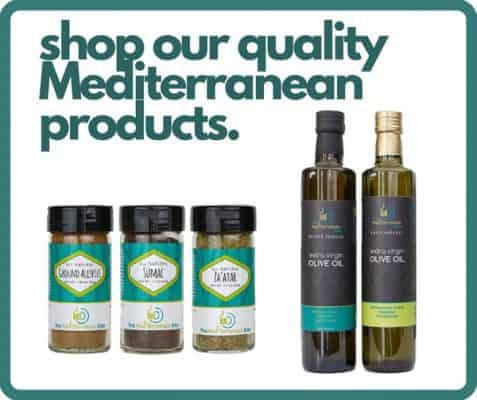 Try our Greek Olive Oil Bundle. Recommended for this recipe: Sweet paprika and nutmeg. SAVE! Try our ultimate Mediterranean Spice Bundle or Create your own 6-pack or 3-pack from our all-natural or organic spice collections. Thanks so much for sharing, Trish! 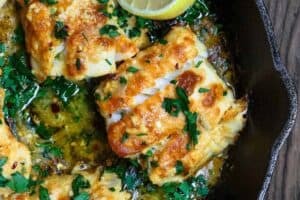 I’ve made this dish twice now and it’s absolutely delicious! I find ground lamb much tastier than beef. The only adjustment I made was to omit the sugar in the tomato/meat sauce. Not sure if that makes any difference, just goes against my cooking principles LOL! 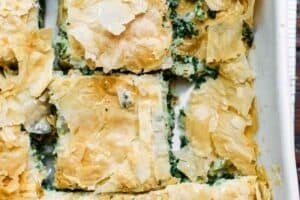 It’s rare to find such great recipes that you can actually follow and get a good result. 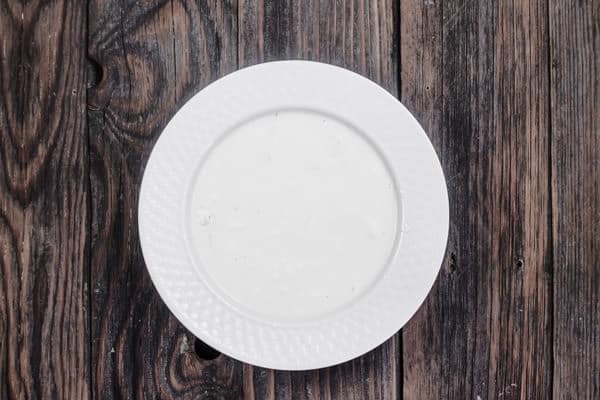 Super web site, excellent recipes all around. I have recommended it to friends, including my Greek friends! Thanks so much. Thanks so much, Judy! 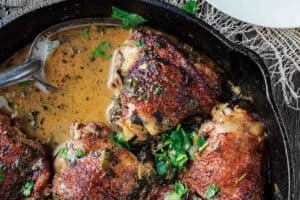 I am so glad you enjoyed this recipe and that it met your expectations! Omitting the sugar is just fine, if that’s what you prefer. It’s a balance thing and may not be as noticeable. Recipe is wonderful, however watching the video…(trying) to watch the video is ridiculous…6 Ads before I finally just gave up on watching! 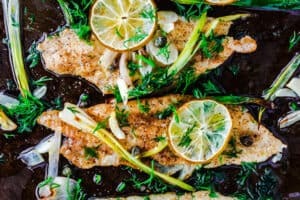 You can easily turn this into a dairy based dish for Shabbat. This tastes so good but is involved and hard to make with my two year old supervisor 😘 I do plan to make the dish again, though wish comfort food like this could be kosher style! I would serve it for Shabbat dinner. Absolutely delicious. Oh I so remember the years when my kiddos were little 🙂 Thanks for giving this one a try! Glad you enjoyed it. I am cooking for someone who is gluten free. 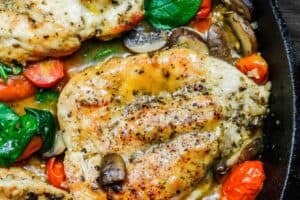 Could I substitute cornstarch or gluten free flour? If you have a gluten free flour that you use regularly, that should work. But i have not personally tried this with a gluten free flour. I have hard Bob’s Red Mill has a GF 1 to 1 flour that works well.